​Our soulmates know us so well on a spiritual level that you really have to learn how to love yourself to make them work. That is what the Growing your Relationship seminar is all about. This seminar is designed to take you to the next step in your relationship, in your evolution to learn how to become a virtual unit. This seminar is not just for couples, but for anyone who wants to develop a relationship, an intimate relationship, a partnership to reach the highest potential. Growing your Relationships will help you build a strong partnership, build a strong foundation, keeping your relationship fresh and new, and is designed to help your relationship work for you. Learn how to really love another person and how to let them love you back, while removing blocks and obstacles handed down to us from our ancestors. When we truly love ourselves, we get the next level of enlightenment. Would you like to know how to live your life without fearing love? Without guilt in relationships? To be loved by your companion? 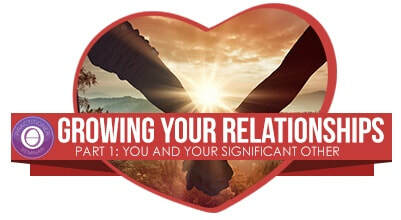 Join the Growing your Relationships Seminar to learn.